I don't know why it's taking me so long to finish my Hawt Sands. No, really, I do. It's because I've been going to bed by 10, like a good little girl. I guess I didn't realize how much I accomplished between the hours of 10 and 1. So here is the front, and I'm about one third through the back at the moment. 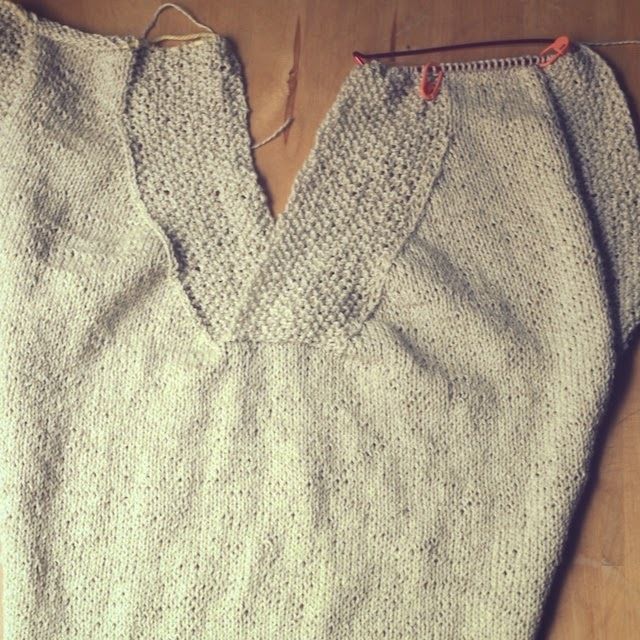 I didn't finish it for the end of the Tops, Tanks, and Tees Knitalong, but I'm close. I officially like working with hemp. I just don't think I did the color work on the front with enough ease. Hopefully blocking will straighten that out. 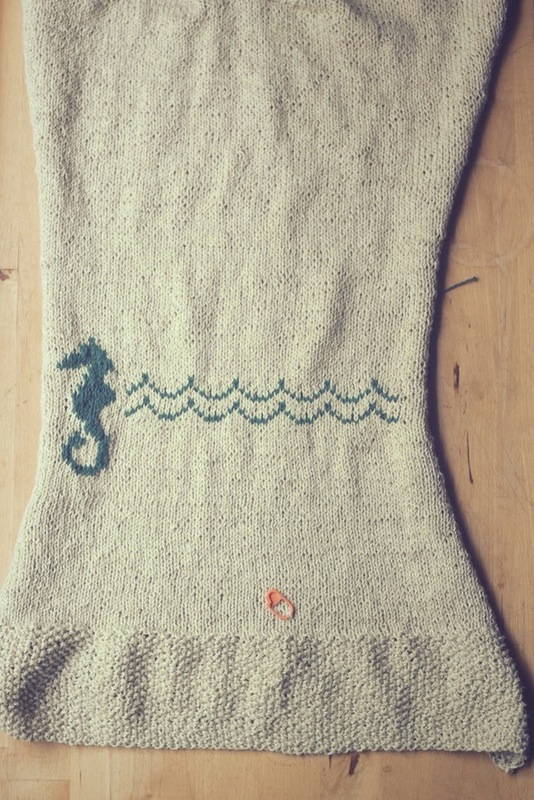 I mostly did fair isle on the front, only doing part of the seahorse in intarsia. I'm not sure how I'd have done the waves that way too, or if it would've been best. 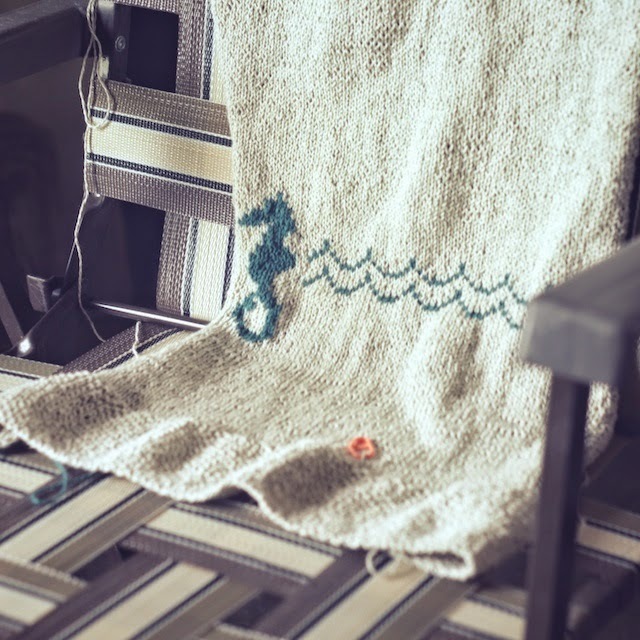 Intarsia is all new to me. So this looks extra skinny hanging over a chair because the edges are curling under. But, even when it's spread out, it still looks kind of small. However, I knit and washed a gauge, I know my own relaxed tension, and I keep holding it up to me. It has to work. I always, always, think things will be too small. If I size up in fear, I also always regret it. So I'm ignoring the nagging thought that this will only fit my daughter and knitting on. And if she is the only one it fits, is that really so awful? I consider that an advantage. Because, whether she wants it or not, I know there's someone who can wear an accidentally, tiny knit. Of course, she's not the only one; just the only one semi-willing. Once I asked my son if he'd put one of my sweaters on for a headless, progress shot, since he complains about taking photos of me in my knits. He ran away from me. Ingrates. I have changed the steep decreases some for the waist, as my measurements aren't that different from hip to waist. I don't think it will hurt the design or the hourglass shape too much. It just made me a little less nervous about the whole fit issue. If it works, I'll post what I did with my FO. So I had a great time knitting with you, Shannon and all of the TTTKAL group. You're a lot of fun and nice company for knitting on quiet evenings. Oh, it's looking so good! I love the texture of that hemp. I hope it behaves and winds up the right size for you (and if not, I hope your daughter loves it!). 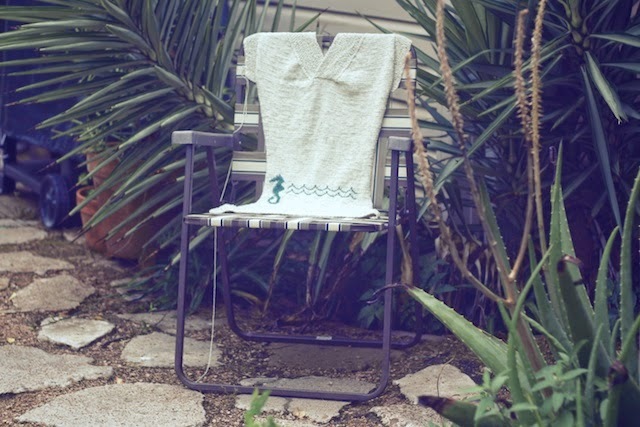 Enjoy the rest of the knit! 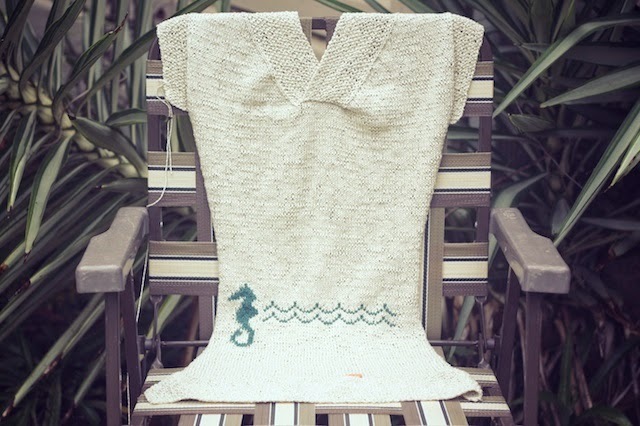 I'm almost done the back of my Just Beachy, and excited to get going on the front. YAY NO SLEEVES!!! It's already looking super cute! Perfect summer top in the making :) If your swatch stretched until the right size, this will probably too right? I've got the same thing going on with my Crash sweater (yup, still working on it) but so far I have antendency to knit garments too big, so I'm hoping it will work out! Thanks, Heather! I ran out of yarn, too- grrr. So I'm waiting for more at the moment to finish the hood. I think it will stretch out nicely with a wash. I hope. My waist and hips are different measurements, just not too extreme. The pattern seemed to be more for a true hourglass shape, whereas I'm a little more straight. Oh, Kim I hope it turns out perfect for you. I'm not afraid of blocking wool out anymore. I feel so much "safer" working with it that other fibers because it's so forgiving. Can't wait to see your Crash.